Oh man…this salsa. This salsa is so good. It’s so good that I’m actually nervous about sharing this recipe with you guys. It’s practically a state secret. The funny part is that the recipe is actually pretty basic — no chunks of mango or even a few corn kernels in this baby. This salsa is classic. In the best way possible. One taste of this? And you’ll never choose store-bought again. 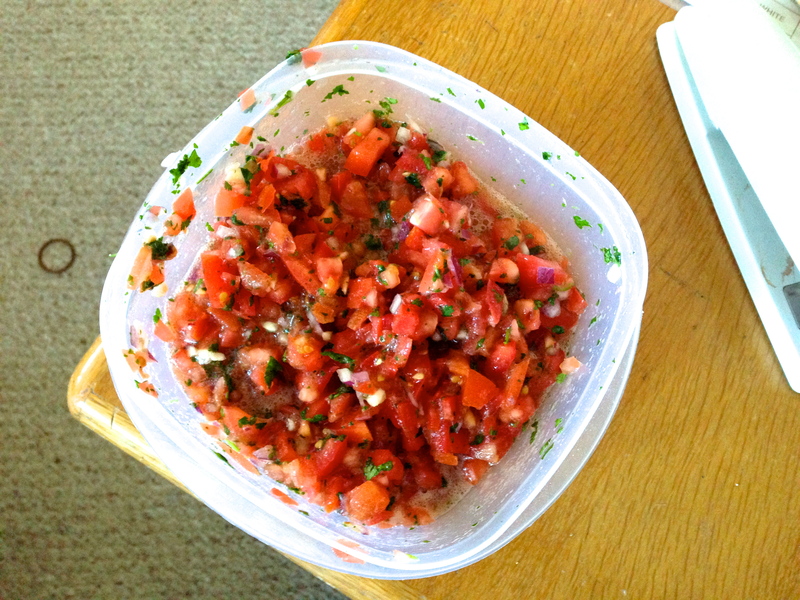 My mom used to make this salsa all the time when I was growing up. Camping? Family gatherings? Cookouts? Chilling by the pool? This salsa was there for it all. I used to begher to make it even more often than she did, because it’s seriously THAT GOOD. But now that I’m an adult and living by myself, it’s been a really long time since I’ve actually had any. So when a craving hit last night, I asked my mom for the recipe and went to work whipping up a batch immediately. And, oh my god, it was such a good idea. Mix the garlic, lime juice, cilantro, onion, and salt together. Add the diced tomatoes; stir to combine. Enjoy with tortilla chips immediately. This entry was posted in Appetizers & Sides, Condiments & Sauces, Mexican and tagged amazing tomato salsa, best tomato salsa, classic tomato salsa, salsa, tomato salsa on March 9, 2014 by Miranda @ Tempest Books.